The delicious recipes in this book will appeal to both vegetarians and meat-eaters - in fact this is the kind of food that makes you forget there is no meat on your plate! The 141 recipes include everything from starters, snacks, breakfast, brunch, lunch, salads and soups to quick and easy recipes, fine dining dishes and gorgeous desserts. You’ll also find handy basics recipes for sauces and salsas, useful tips on how to improve your vegetarian diet, menu ideas and recipes for special occasions. This book also includes recipe contributions from top chefs Stephane Reynaud, Skye Gyngell, Rowley Leigh, Francesco Mazzei and Tom Pemberton. Handy recipes for basics are included, such as classic sauces, relishes and garnishes. Quirky French design with die-cut cover and stunning food photography make this the perfect book to buy for a gift. 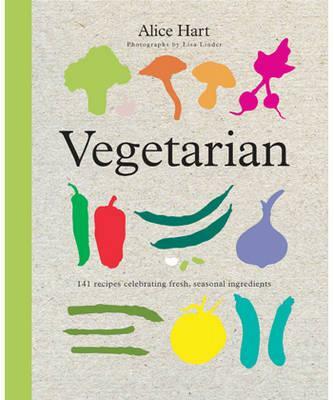 I adored Alice’s Cookbook, which was published late last year as part of the New Voices in Food series. To my mind Alice’s recipes represent the best in contemporary British food writing. She cooks seasonally using healthy ingredients, including wholegrains and pulses, with an eclectic range of influences from classic French to macrobiotic. Alice’s latest offering Vegetarian is every bit as good as her debut. All of the recipes may be vegetarian but this cookbook deserves to have a broader appeal like Yotam Ottolenghi’s vegetarian cookbook Plenty. The opening chapter focuses on the first meal of the day and each of the recipes could be used everyday. The almond milk and maple porridge would be perfect for this time of year and there are instructions for making your own nut milk. Some of the salad recipes are wonderful, like the winter salad made with faro, roasted carrots, walnuts, prunes and chevre.